As the new school year is really getting underway, the Homeschool Crew Review is winding down for this calendar year, and I am completing my last review. It's always fun to end with a review of something I might not have found on my own, but that really works well with our other curriculum! The Critical Thinking Co. generously offered the crew a variety of curriculum for review, and my 4th grader and I have been reviewing Language Smarts Level E. Language Smarts is a language arts workbook series that can be used as a complete curriculum or supplemental resource. Level E is considered 4th grade, so it's been a perfect supplement for us. We already have a language arts curriculum that we love, but it mostly covers the technical side of language arts--primarily the spelling and grammar side. I had been thinking I needed something that covered more of the other components of language arts. It's such a rich subject after all, and there's so much more to explore! I needed something that would help cover other topics like similes and metaphors, reading comprehension, poetry and thesauruses and all that other neat stuff. Language Smarts actually covers enough material to be considered a complete language arts curriculum: reading, writing, spelling, punctuation, grammar and thinking skills are the major subject areas, but the numerous subtopics help you fill an entire year with a variety of language topics. For instance, "Parts of Speech" has 20 lessons that cover nouns, verbs, pronouns, conjunctions and more. An entire section on Writing covers the author's purpose, the writing process, personal narrative, opinion writing, and informative writing. So much more is packed into this nearly 400 page book that I couldn't begin to describe the topics covered! Each lesson has a box that sets apart a short description of the content being covered, defining any key words and explaining concepts. Instructions are written clearly and highlighted in yellow. There are often examples. Then the activities follow. 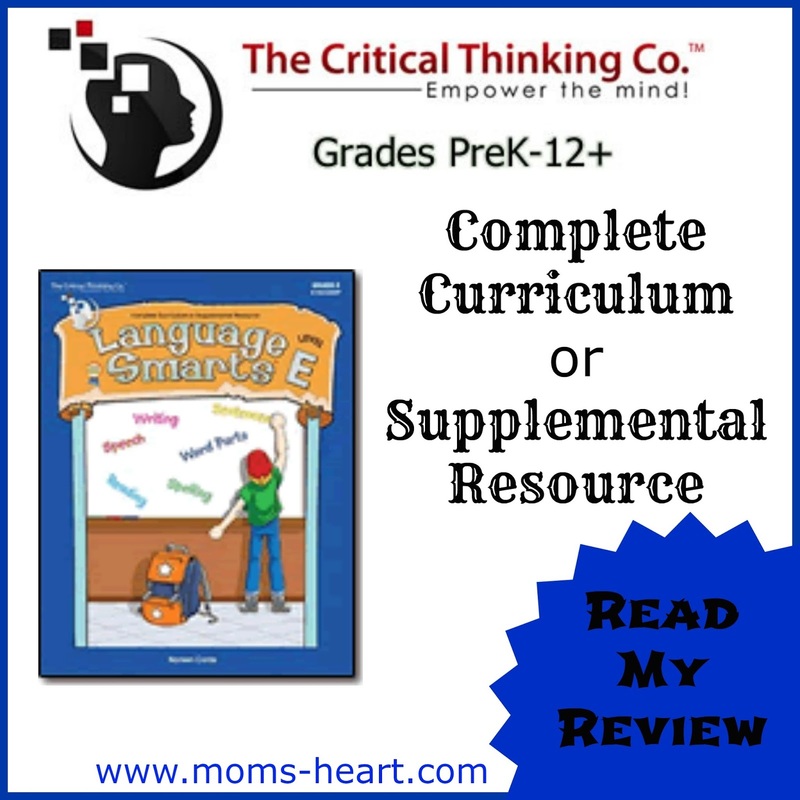 The layout of the workbook means many students can work semi-independently (parents and teachers are encouraged to be available for support), so it can be used in a variety of different ways besides as a core curriculum. There is no teacher's manual or lesson plans, and the topics are fairly independent of each other, so it was easy enough for us to use it as a supplemental curriculum and move around in the book choosing topics that met our needs. As I said, our language arts curriculum covered the technical side of reading and writing, but we needed something that would help us explore everything else. One week we worked on Dictionary skills from the Reference Materials section, and another week we were able to work on Context Clues from the Reading and Writing section, and then it moves into Similes from there. This has really helped us round out our language arts curriculum. I love the variety of assignments. There are crossword puzzles, word searches, multiple choice, fill-in-the-blank, write your own sentences, and more. This keeps the assignments from becoming monotonous or "boring" for kids who like to keep things fresh. There is an answer key in the back, though I haven't needed it yet. If you use this as a complete curriculum, it's open and go. Depending on your child's previous phonics and spelling instruction, and their natural abilities, the spelling section may not be enough; or it may be just perfect to use as review. Obviously, every child is different. I do think the rest is sufficient for this age/grade range. Elliott will often ask for this program instead of his other language arts program, and seems to like it as long as we don't don't too many pages in one day. However, we both still like the other program, which I feel covers spelling and grammar concepts more in-depth, and that's necessary for us. Going forward, we have decided to continue using this in conjunction with our "technical" language arts program, allowing this one to offer the "everything else" perspective. Whatever we don't finish this year can easily be used at the beginning of next year for review. On that note, I do have one suggestion. Since the series is primarily labeled by "letter," with this being Level E, I think they could remove the grade level (Grade 4, in this case) from the book. In my case, the book is so large that we'll never finish it this year using it as a supplement, but truthfully, it just seems like two different styles of labels is redundant. I think offering a suggested grade range (perhaps 3rd-5th for this particular level) in the product description would be more suitable, and would make it more appealing to a wider audience. Overall, I'm very happy with this curriculum. It is available in both paperback and as an eBook, so you can purchase your preference. There are also levels B, C, and D (approximately 1st, 2nd and 3rd grade) available. I can see these books useful in different homeschool environments, as well as tutoring sessions. The Homeschool Review Crew has reviewed various products from The Critical Thinking Co., so be sure to check out the rest of the reviews!